It made me chuckle when I received a cheque for £50 ($85) from the BBC for my recent appearance on BBC News 24. It is rare that I get both the satisfaction of responding to a question pertaining to the Kilroy-Silk affair on live TV that, to paraphrase, “Surely this was not objective journalism by Kilroy-Silk” by saying “Surely you are not going to claim that the BBC itself is purely objective and does not take editorial positions in issues?”… and then to get paid by the BBC for saying it! But then it dawned on me that £50 is less than half of the TV tax I am forced to pay annually to fund that monstrosity… and in any case they were only giving me back my own damn money. Oh well. Wow! Does the BBC routinely pay for interviews? It’s a real no-no over here, and just isn’t done unless the news division can hide the payment in an entertainment contract, as with Michael Jackson recently. Goodness! I’d think twice before publishing my home address on the Web. Must be a desirable neighborhood or something. Mine’s listed in the phonebook, but I still wouldn’t write it on the men’s room wall. When I was on a BBC show a few years ago, they paid for my train travel to Pinewood Studios, my hotel in Slough (as grim as it sounds), all my meals and drinks, taxis, and laid on an impressive green room spread for everyone on the show. It’s pretty easy to spend other people’s money. Forgive me but let me say this. The government collects taxes on your TV. 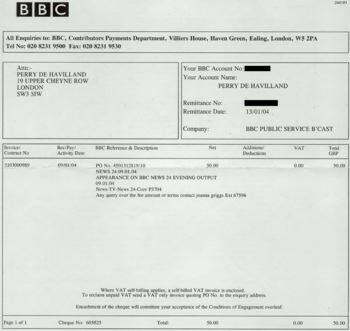 The tax is for the BBC alone, a “private” organization. They use the taxes collected, under threat of legal force against the ones being taxed , to then attack the government. How did this symbiotic relationship develop? Is the BBC private? If so how is it collecting, or I should say spending, your taxes. gunner: How did this symbiotic relationship develop? Is the BBC private? If so how is it collecting, or I should say spending, your taxes. A very long story. The BBC is independent (more or less) which isn’t the same thing as private. Compare the US Supreme Court: it is paid for out of taxes (tho’ not hypothecated ones), but it doesn’t do the Executive’s bidding. Don’t you think there is something to be said for plural institutions? Chelsea is to capitalism as Hampstead is to socialism. Perry: Don’t want to be depressing (though why break a habit? ), but you left some tax out of the sum. You only get to spend £30, ‘cos £20 goes straight to the government proper. So much less than half your money back.